Outside - There is a large Free Car Park with Parking For approximately 50 cars. There is disabled access to the main building from the car park. There are large lawned areas with picnic tables for outside functions. There is also a small quiet nursery garden with seating. Inside - Entry is via a large carpeted hall which leads to the rest of the facilities. There is a small carpeted Room ( 7m x 4m ) with cushioned chairs. 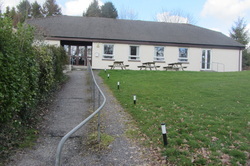 There is a well equippped kitchen containing two gas cookers, a warming cupboard, fridge, china and crockery with a serving hatch to the main hall. The toilets, ladies and gents and disabled, have been recently refurbished to a high standard.